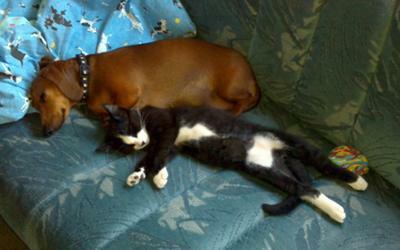 This little guy is Felix who is seen enjoying a snooze with his best friend Molly the Dachsund. Felix was rescued by my son out in the country when he was about a month old. He was near death from starvation. Now he and Molly are best friends that wrestle, chase and play with each other all day long, except when they're sawing logs! That is my Ringo's daughter, she can play with any one!!! Can't wait to see her again. Love this photo, please share more. Felix and his pal look relaxed there. You can tell from this picture that they are truly close friends. When I was little a had a dog and a cat who were the best of friends, however, it took them a while to get over the "I'm a dog, you're a cat" drama. I must confess that my dog was friendly from the beginning but the cat was afraid of him (we adopted the dog first, so that may explain it). I love this picture. Thanks for sharing it.